The last of the tasty mangoes ripened, and was consumed eagerly, within the past fortnight. 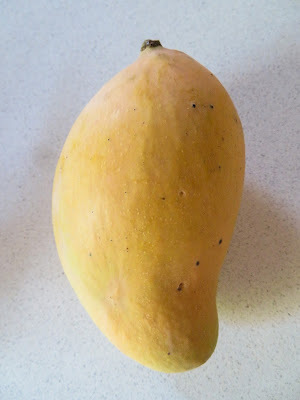 This rounded off the mango harvest at 10… a satisfactory number for the third bearing season of the Maha Chanok seedling tree. At the same time, we cut a bountiful bunch of Pisang Awak bananas, so bountiful that these were shared with family, friends and neighbours. Eaten fresh during the day, and consumed as dessert each evening in the form of banana sticky rice and banana fritters, there was no need to visit the greengrocers for some weeks. In its third fruiting season, the starfruit has ripened occasional fruit through both spring and summer. However, with a massive flush of branch-clasping, purple and white flowers in late summer, the tree has very quickly filled with bunches of tiny stars. Maturing through early autumn, we are just beginning to pick an abundant crop of fruit… and family members are placing their orders for evening starfruit juice! 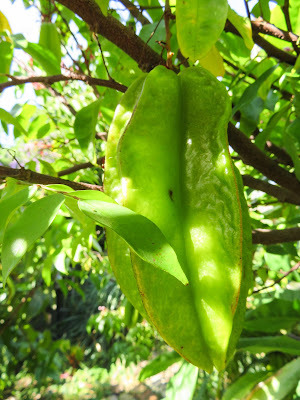 An enormous starfruit sits alone in its part of the tree.